Back to normal and a sprint finish around the walled city of Lugo. Stage 4 Wrap: a win for the plucky Direct Energie team? No, this was no lucky break, instead a big move of 21 riders established itself with over 100km to go and stayed away to start the final climb with a comfortable lead on the peloton. On the final climb Lilian Calmejane rode away à la pedale from everyone to win the stage. Having written yesterday that the team hadn’t won a World Tour race since 2013 their neo-pro took a good stage win and bike sponsor BH, a Spanish manufacturer, will be particularly pleased. Calmejane is a promising rider but sees himself as more of a classics contender, a Sylvain Chavanel kind of rider but on a short climb he was able to put his power to work. Once over the line he gave capable interviews in English, a by-product of a management degree. Darwin Atampuma took the overall lead as he continues his excellent season and for a change there’s every chance he keeps this for more than a day given BMC will value this opportunity; Ruben Fernandez cracked on the final climb. A select group came in together while Steven Kruijswijk, Miguel Angel Lopez and Igor Anton where among those to lose time. The Route: a flat run along the coast before they turn inland at Ribadeo and soon after an unmarked climb, 5km at 5% but with some 7% along the way before the feedzone, intermediate sprint and the day’s noted climb the Puerto de Marco de Álvare, almost 12km an an average of 3.8% as it tracks up a valley with some steeper sections higher up. The Finish: they reach Lugo – famous for its walled city – but instead of going straight to the finish go for a loop in the countryside (without crossing the finish line). The graphic shows the final 5km but note the red route on the map near the profile, they pass by the river before gradually climbing up and the steepest part comes as they approach the city walls with 2km to go and then tour the city walls to the finish line. The Contenders: Gianni Meersman again? He took one win because he was the fastest and had the best team so a repeat seems logical. Still there’s plenty of competition, first from rivals Lotto-Soudal with Tosh Van Der Sande. Trek-Segafredo’s Niccolò Bonifazio is anther pick as is Orica-BikeExchange’s Magnus Cort Nielsen. Bora-Argon 18’s Michael Schwarzmann was second on Stage 2 and a surprise name but he’s had several top-10s this year in sprints so he could be in the mix again. So far the breakaways have managed to stay away so the chance of a move sticking rises today too, there are no big sprint teams to steamroller the race. Weather: hot and humid if the promised rain appears, a top temperature of 32°C. I think you might have the wrong Trek rider there. Bonifazio maybe? You’re right, a lapse there. Giacomo Nizzolo (unaccented) is not racing La Vuelta. You mean Niccolò (accented) Bonifazio. Is the final sentence/column missing? On topic: Go Gianni! Thanks for the preview. Always wondered and can’t find it on google – what does ‘à la pedale’ mean? Thanks in advance. Darwin Atapuma seems to have had a break out yer this year and animated a lot of races. Is he a man for individual stages and short jersey stint, similar to Voeckler, or could he potentially go for GC in the Giro/Vuelta? GC seems too much but stages, mountain jerseys and a spell in the lead are ideal for him. Very happy for Atapuma, after all the courage he displayed during the Giro while his mother’s passing away. 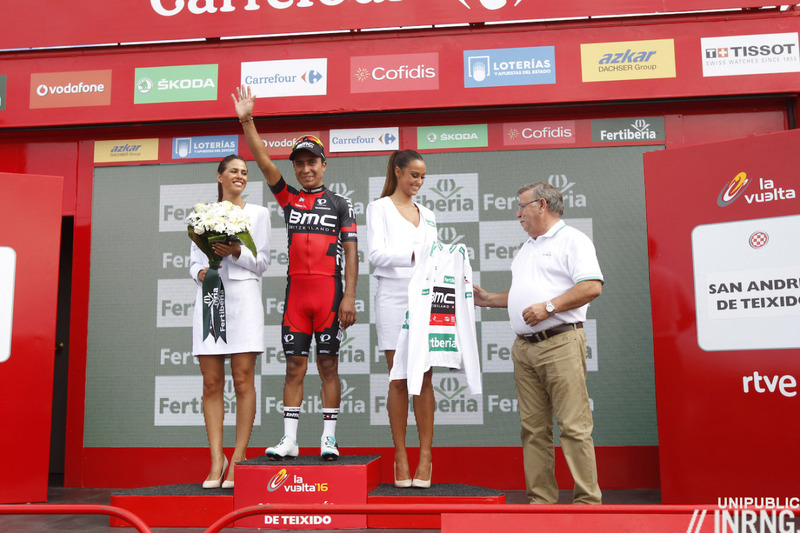 Hugely deserved, and I believe he ‘s still to take a stage during the Vuelta. A joy to read as always. Inrng, have you done a race preview (that I can’t locate!) as you did for the tour, briefly summarising each stage and picking out the must watch days? Thanks as always, best cycling journalism around. Nikias Arndt doesn’t get any chainrings? Interestingly was listening cycling podcast interview/Q&A with Joe Dombrowski before watching yesterday’s stage and he said Atampuma is a nightmare to be in the breakaway with because he just sits in refuses to share the work and then when he does go to the front he surges with speed varying efforts of those in the break with him. One day he will be repaid for such actions. It’s annoying for others but it’s his style and as a small climber he can yo-yo like this and disrupt steadier “diesel” climbers like Dombrowski. Once again an unprotected and unguarded post in the form of road furniture was the cause of the crash which resulted in broken bones in the closing kilometers of today’s stage.. These recurring problems, like the endless Moto problems, require urgent attention and resolution from the UCI. Why should serious safety matters not apparently receive the urgent attention from those responsible. The Kruijswijk et al. accident today was absolutely unacceptable. You can’t screw up with peoples health and career and just walk away. How can there be this much incompetence at the UCI officials level – they are the ones ultimately responsible for Safety. The organizers can’t just say oops sorry I hope you get better soon. a) The riders should do some kind of protest tomorrow – forcing some kind of public commitment by the UCI with explicit steps on how changes will be made to avoid this in the future. b) The UCI should make sure that athletes are covered by injury and career insurance in the case neglect or incompetence on behalf of the organizers or UCI safety officials. c) The responsible safety individual from the UCI that didn’t catch the mistake – should publicly say he made a mistake and resign effective now. d) The responsible person at the Vuelta /ASO should admit a mistake and resign immediately. f) Someone should hold the individuals above publicly accountable – which is super harsh – but creates a disincentive for others to be lackluster in the future – of course this isn’t going to happen …. so we have to play this stupid game of having an investigation which buys time so people forget about it. The UCI aren’t responsible for this, a range of waivers and get outs firmly puts the emphasis on the race to get the course right and on riders to check the course too. Unfair? Perhaps but note the UCI is a mid-size governing body, not some omnipotent force ruling over the sport. The UCI can review and recommend things after a stage but it is not responsible for validating the course nor securing it on the day. In a press release issued today the race effectively says a mistake happened, that the finish wasn’t secured properly. Where is the AIGCP safety rep(s)? Part of this organization’s responsibility should be to have someone (preferably an ex-pro with good negotiation skills) drive these courses, perhaps the morning of the race (or sooner if possible, though a lot of the structure of the course is probably not completed too far enough in advance) charged with identifying dangerous hazards like these and insisting they be remediated. If the organizers fail to comply, they could find themselves the target of legal action if injuries occur and perhaps strikes by the riders as well. A few lawsuits and sit-down strikes might convince race organizers to pay attention to the safety rep’s suggestions. I appreciate that the UCI is a small organization. I will contrast the UCI with Alpine Skiing – the FIS, which is also a small (er?) organization. In Alpine skiing the FIS official and the local officials, must take tests every few years proving they are still mentally capable of remembering the rules; the rules stress safety first. This means the race will not start or will be stopped if there is anything that is not safe, no matter how bad it is for TV. The FIS official as well as the local ‘licensed’ officials are on the line for safety and will be held responsible. What is key here, if you are going to hold a position of authority at a race you must be licensed, even the locals. Secondly, the FIS official is the one responsible even if the local officials screw up. Any of the designated officials can stop the race if things are not safe. There is big effort prior to races making sure all venues are safe prior to competition. In order to be able to host a race the venue is homologated (pre-approved) by the FIS for a finite number of years, with pre- identification of obvious safety issues. If the ski hill changes the course must be re-homologated. Both posts – very good points. But all we’re going to get – from many – are excuses. And definitely no action from the UCI. All accidents are inevitably acceptable because they are accidents ! This is not an accident. It is a mistake, an oversight, an error. It was avoidable. It was not intentional, it was a mistake. Perhaps a costly mistake. Look at you judging it, calling for people to resign. How many involved in the race saw it and you don’t know ? or nobody knows ? Those responsible in the race seemed to have publicly admitted and apologized. It feels like cycling has a terrible safety record, though I don’t know if the statistics bear this out. The problem is, there aren’t any statistics. But on a day when, on BBC Sport, a former professional rugby player is announced to be taking legal action against his club over concussion injuries, it surely is high time that safety should be of the foremost concern. Forget the rival factions in cycling, this should be an issue that is common to all. I don’t know anything about the rugby player story….but tell me, was he forced to play with the concussion against his will ? more importantly, who was responsible for his first concussion? who made the decision to make playing rugby their (current) job ? if the answer to the first question is yes (by the player) then legal action would seem to be needed to determine validity. if the legal action is about the fact that he received a concussion while playing rugby, that risk seems obvious. For the bicycle races, as The Inner Ring points out above, it is the race organizers who are responsible for setting up the course, checking it, etc. and on riders to check it also. When the team car drives the race route (do they do that for every stage in a tour, Inrng ?) and / or the riders recon it, they should be looking for these things, although perhaps this post was obscured at that time ? (maybe each team should have an employee just for that) if not, it should have been spotted by a team member / rider. the race has said that the teams were to be notified of it, and someone with the race was to ‘safety’ it. It is a terrible oversight, no doubt, and fortunate someone was not critically injured. Whoever knew it was there and that it needed to be removed / marked / barrier should have checked that it was, and, made sure the teams knew about it. The race seems to be missing that double checking.